The cool new Home shirt was designed in homage to the Shirt worn by Diego Maradona & the Champions at the World Cup '86 in Mexico. The jersey features soft mesh fabric for excellent air flow. 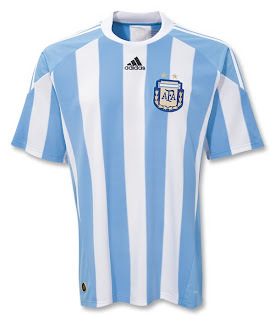 Embroidered Argentina national team crest over your heart and adidas brand logo on center. It is made with adidas' ClimaCool® - advanced material engineered to reduce heat and moisture build-up, allowing increased comfort and performance – to keep you feeling fresh no matter how long you play, train and cheer on your Albicelestes.